Thinking of taking your dog(s) abroad? Taking your dog to France? Then this is the site for you! We’ve written this blog because, in preparing for our first time abroad with our three dogs (two greyhounds and a lurcher), we found it very difficult to find any decent information on what it actually is like to be away in a foreign country with your pets. There’s plenty to read about how to arrange the pet passports, but what about heartworm, lungworm, processionary caterpillars ….. The worries during the six months after arranging the passports grew and grew as we wondered whether we should just stick to the good old UK for our pet holidays! In January 2012, the Pet Passport rules changed and became much simpler. For the up to date rules, see our page New DEFRA Pet Passport Travel Rules from 2012. Please also be aware that this blog is based on our experiences. We won’t accept any liability arising from anything we’ve written here. Remember that it’s your responsibility to ensure you have everything in order for your pet’s travel. If you are unsure about anything, check with DEFRA before you travel or with the country to which you are travelling for country specific queries. Incidentally, the University of Bristol is conducting a survey into dog travel trends and the perception of risk to those dogs from parasites found abroad. As many responses as possible are needed so click on this link to take part. The survey is running from Nov 2012 until further notice. I have traveled many times to France and back with dogs. No one has ever seemed to look at the name in the passport, the only thing they seem to worry about is that the dog is chipped, has had the rabies vaccine and that if you are coming back to uk they have been dewormed. The passport checks are done at the port of departure for chips and rabies injections. On the way back they check the chips and worming treatment at he port of departure. Don’t know whether cats have to have the rabies?? Vet will know or the defra web site. Hope this helps. As Colin says. The other thing you’ve u might do for advice is to call the advice line. If you look on the govt website which gives all the details you need regarding cats and dogs, there is a number you can call. I have called them a couple of times and they have been fab, really helpful both times. I am about to travel to France on Le Shuttle. My Spaniel has had the necessary pre-treatments but I am nervous about finding a Pet Passport friendly vet near La Rochelle for the Praziquantil tapeworm treatment before we return home. Is there anyone out there who has been to that particular area and visited a vet for this reason? If so, can you walk in or do you have to make an appointment? In most of the links the opening hours are posted and there are some with reviews in French but you can use google translate if like me your French isn’t so great. . I wouldn’t worry about a vet being ‘pet passport friendly’ I can’t imagine any vet refusing to stamp and date a passport entry. The links have phone numbers so you can always check before you go but I have never found this to be an issue. Hi, has anyone traveled from Bulgaria to the UK ? If so, have you had any problems with passports etc, and where is best place before leaving France, to get the worming done ? Thank you. Hi ,no muzzles required,they will have to remain in the car for the ferry journey as well. You will need to use a muzzle for the ferry if they are leaving the vehicle (ferry company rule) and they should be ‘restrained’ within the vehicle in France and Spain. In a crate or doggy car harness. We have a soft muzzle for our weimerarner but it only stays on for the necessary time to clear through officialdom. In our motorhome she stays in a crate and sleeps, in the car it’s a doggy harness and she sleeps on the back seat most of the time. You will love France as they are very dog friendly. Have fun its not as stressful as it seems, just make sure you get the worming treatment noted by a vet in their doggy passports before return. We usually go on the Le Havre route overnight and get a dog friendly cabin and the dogs are obviously allowed out of the vehicle and there are doggy walking areas as well. The Santander ferry is similarly equipped. If we go from Dover/Folkstone we let the train take the strain and use the Chunnel as we stay with the car/motorhome and dog all the way and it’s only half an hour (longer to queue than to travel). The Dover Calais ferry we have never used but understand that the dogs aren’t allowed out so we avoid it. Don’t think it’s a terribly long journey though so would probably be OK for Lucy. Might investigate in October when we take the Motorhome over for the winter. Hi I am taking my dog to the poitou charente area of France. We have had the Rabies jab he has monthly advocate. Does anyone know if my dog needs to wear a scallabor collar for ticks in tjis part of France and secondly can it be used alongside ADVOCATE spot on treatment ? Any advice come first time out of uk with pet. No, we will not be traveling for a long while yet, but I thought it would be goodo know before in advance, so I knew what to expect. Once again, thank you,and will keep this in mind. Be good to still have the address for vet in France though, as may be a while traveling across Europe :-). We are just back from a trip to Alicante from the NW of UK via Eurotunnel. We have two well behaved Cavalier King Charles Spaniels. Anyone got any idea if it is ok to stay near to the dogs on a seat in the kennel area rather than leave them alone during their journey onboard or if two dogs might be allowed in a cabin please? You can book dog friendly cabins on certain ferries to and from Le Havre, Santander and Bilbao with Brittany ferries. You have to get in early as these cabins are very popular. As we are retired we can afford to take the ferry as and when a cabin is available but even then they can be hard to find. I always book via the camping and caravan club as they do all the enquiries with the agents which can take forever online. We can also give them a wide range of dates to choose from. You can only ‘visit’ the dogs in kennels on board and aren’t allowed to stay with them, the dog friendly cabin is great and we have used one on several occasions now. The only alternative for us is the Chunnel which we use when touring on the way down to Murcia in our motorhome. In the car we do it in two days from LeHavre stopping for one night just short of Spanish border near Bayonne. You will need to book well ahead to take your dog to Santander as kennels and dog friendly cabins sell out well in advance. I would also advise caution with the Scalinoe collars. They seem to work okay with bigger dogs but it made my little dog very poorly and it wasn’t an isolated case when I read reviews on the collar. Our Spanish vet recommended an oral medicine which we have used with no adverse reaction. Good luck enjoy your holiday! Scalibor collar strongly recommended, always check the size of collar for size of dog as the strength varies from size to size. Some dogs have had a reaction to the collar but ours does not. It should make no difference if Advantix is used as well, we always do Advantix as her normal treatment (which reminds me to check now as it’s probably due). One tip that we had was to take the scalibor collar out of its packaging the night before putting it on to the dog that way the initial strength is diminished slightly. Don’t forget to visit a vet between one and five days before returning to get the pet passport signed for the worming treatment. Hope that you enjoy your trip away, you will find the process is fairly painless and will wonder what you were worried about. Hi, I am about to bring my three dogs to the UK from Poland. The vet has provided us with the new style EU passports for all of them but the stamps are all in black ink and I read somewhere this is not allowed, can anyone comment on this ? Has anyone experienced any problems with this ? I also heard that the passport must not be completed in black ink, I can’t see any of these guidelines on the DEFRA website so hoping this is not the case, we are travelling in 4 days time and I am in a panic we will not be let into the UK. I also noticed one of the stamps is quite light and slips of the page a tiny bit. Just looked at Lucy’s passport that the vet issued to her. It is filled out in black ink and the rabies jabs (she has had two now) are in both blue and black, one of each. The worming treatments (4 times) are also a mixture of blue and black. We travel fairly regularly to France and Spain and have never encountered any problems with this. The main things they are looking for are that the chips match the passport, that they have had a rabies injection and have been wormed in accordance with DEFRAs rules (between one and five days of crossing into the UK). Hope you have a good trip with no problems. I am taking my dog to Pontos in northern Spain. I’ll be there for a week before driving back through France to catch the ferry. I’m trying to find vets around the area as he needs to have the tapeworm vaccination at least 24 hours before entering the UK. Can any one recommend a website to find a vets or happen to know any in that area of Spain? Vets are quite easy to find in Spain and in France. We are currently residing on our verandah in southern Spain as our dog Lucy was poorly yesterday and had to visit a vet for an emergency consultation. She was examined had two jabs, one for a tummy bug and the other for a sore throat, was proscribed a course of pills and we are feeding her an intestinal dinner that the vet sold us for the next three days. The bill? 35 euros….. In the UK I would have expected it to be nearer if not over a hundred pounds. It ain’t all bad. I’ve really enjoyed reading this blog and hearing of the skinnies adventures! We are taking our rescue saluki lurcher to Annecy this summer, and will be getting her pet passport sorted out this week. If anyone would be able to advise me on the exact process that should be followed in terms of worming before travel (she is regularly wormed but I know that the rules are quite date specific) that would be lovely. When visiting vets in Callais before returning back, do people tend to book appointments, or are there walk in centres designed for this specific reason? Sorry for the novice questions! If anyone has been to Annecy with a pup I’d love to hear your stories! As Paul says below really. We steer clear of the vets in Calais, they know you must get this treatment and charge accordingly. I would advise the use of a Scalibor collar as well, although some dogs do have a reaction to them. We tend to leave it out of its packet overnight before putting it onto Lucy, she has the odd scratch at it but nothing more. Look them up on the net for the pros and cons and make your decisions then, or alternatively, ask your vet. If you look above at my answer to Claire’s question you will see the type of wormer Lucy has. France is very dog friendly (apart from the beaches) and a puppy Saluki cross will get you mobbed by potential patters and strokers. The only French we learnt on our first trip was ‘ Je suis desolate, mon chien jaunty, pardon’ or ‘so sorry my dog is very playful, excuse us’. How did your trip to Annecy go? We have a Saluki x greyhound rescue 3 years old and a border collie aged 7. Would like to visit france but nervous with 2 big dogs and a large caravan. My Border Collie needs to swim as she has very bad osteoarthritis in both her front feet so water a priority wherever we go. Any advice very welcome. If you are travelling from UK your dogs won’t need deworming before they travel, however on the way back it’s a minimum of 1 day and a maximum of 5 days before travel that you need to deworm. The deworming has to be certified by a vet (which it appears you already know from your question). I haven’t been to a vet in Calais since I usually arrive there only for the ferry. I have been to vets in several small towns in Europe and they do seem to be everywhere. Ask the locals there will no doubt be one near you. It may be more convenient to do it just before (1day min) you head to Calais. Most vets will allow both appointment and drop in services. Check with your local vet. Better to take an appointment if you can. Don’t forget to have the passport stamped, signed with date and time. Probably the best thing to do is check the local phone book or ask a local when you get there. There are usually vets pretty much everywhere. Incidentally, there is great campsite within easy walking distance to the vets and the town and some beautiful river walks. we are currently in Spain and will be travelling back soon via the same route. Most continental vets are now aware of the pets passport scheme and will happily treat the dog with the worming treatment and sign and date the passport. Vets are abundant in Spain so you just need to find one between one and five days before you travel back. We use one in Aguilas that knows Lucy then travel up via the Madrid ring road to Bilbao with one overnight stop. If you want to seek a vet out where you are staying just contact a local dog rescue centre, most are run by English or English speaking people, they will happily point you in the right direction. When you return via Bilbao it will be much like leaving the UK, passport control will ask for the passport and ask you to scan for the chip with the scanometer(or whatever the name is) then you are through and in the queue. Don’t forget to take a muzzle for the boat, they can get quite sniffy about it sometimes. Most people discard the muzzle afterwards for deck walkies as long as the dog is friendly. I am traveling to Poland with my Stafforshire Bull Terrier. We are traveling by car and go through France, Belgium, Holland & Germany. From the web site “PetTravel.com” I read that France & Germany have a ban on the import of this breed. However we are not importing the dog but traveling through the country. Does anyone know if it is safe/legal for us to travel through these countries? Germany restricts the import of the following breeds and their mixes: Pit Bull Terrier, American Staffordshire Terrier, Staffordshire Bull Terrier, Bandogs and Tosa Inu. Transit or export of these breeds is permitted. Additionally, the following dogs can enter Germany only with prior authorization from local customs officials and must be evaluated at the owner’s expense: Alano, American Bulldog, Bull Mastiff, Bull Terrier, Cane Corso, Dogo Argintino, Dogue de Bordeaux, Fila Brasileiro, Mastiff, Mastino Napolitano, Mastin Espanol, Dogo Canerio, Rottweiler, and Perro de Presa Mallorquin. It seems that transit may be allowed but check out the link above for the different countries you plan to transit through. I am returning to the UK from South America with my dog next week… we are flying into Paris and then driving home from there. I will have all the necessary paperwork for entering Europe completed here in Chile before we leave (dog is chipped, her rabies vax is in date, and she will have her anti-tapeworm in the few days before we leave). I am confident that I have done everything necessary to get her OUT of Chile, IN to France, and IN to the UK… but is there anything I need to get her OUT of France? If that makes sense? Here in Chile she has to be cleared by customs and her paperwork authorised before we even get to the airport, or they won’t let her travel. I know people get their dogs tapeworm treatment before leaving France but I assume this is because it has to be done in the few days before departure,otherwise they would just have it done at home in advance? My dog will have a vet certificate from Chile (in Spanish and English) confirming that she has had this… do we need anything else? Sorry for the ramble, it’s stressful enough moving halfway round the world without a dog but this is a whole different level of stress!! Can anyone recommend vet/s near to Mont Blanc? We are travelling there in July. Last year we were recommended to use a lovely vets in Bourg d’Osian so would love to receive recommendations rather than try and find one ourselves. Hello.I am emigrating to France in September.No intention of coming back.I have rescued a 2 year old dog (Jack Russell)called Dexter,and he will come with me.Also not returning to the UK. What do I need for him?He is vaccinated and microchipped already.Many thanks. Denise. just your EU pet passport. The details of the rabies vaccination will need to be added (signed, stamped & dated by your vet). I think thats all. You can change the details of the chip for your new contact details wherever the local official office or authorised vet is able to do so when you have settled in France. Thanks Paul. That’s kind of you to get back to me and help. Thanks so much for the time in providing this information – we are considering our first trip to France this year with our 18 month Wheaten and this has all really helped. Much appreciated. Hello, does any one know how long last dog rabies vactination for travel abroad? Is it need to be renewed yearly or every 3 years. Had one last year done. The passport entry should have a ‘valid until’ section filled in by the vet, this tells you when the rabies jab is good till. The rules have just changed with regard to the rabies jab, new ones are valid for three years and the old ones were only for two. The customs official will only look at the date as filled in by the vet and will refuse entry if not valid. Hi I am going on holiday to Morgny in Normandy in August with my 2 dogs and need to find a vet that can administer the worming treatment before they come back, does anybody know of a English speaking vet nearby or can anyone recommend one in Calais, thanks, Rebekah. You will find vets in all reasonable size towns all over France. They prefer you to make an appointment 24 hours in advance (although they will generally see you anyway, usually accompanied by a large sigh and rolling of the eyes from the receptionist). You will be able to ask someone to ring for you at hotels or campsites if you don’t want to go looking. Best not to wait until Calais as they know they are your last chance and charge accordingly. Hope you have fun France is very dog friendly. Hi, has anyone had problems at Bilbao with new pet passports? My UK vet has not stamped rabies section as said its not required just signature and address etc. Brittany ferries website also confirms this. Have heard such horror stories. The passport must be stamped with ‘Official Veterinarian United Kingdom and include their SP number’ and signed and dated with both the date given and valid until date filled out. Also the manufacturer of the vaccine and type number must be completed. And I really do mean ‘must be’…… If Bilbao let you through the UK won’t. You can get it done in France as well. I would suggest that you revisit your vet and insist on a stamp etc being placed in the passport or go to another vet. Just came back via Bilbao last week, no problems at port at all. Just a bit hard to find the place. Hi Colin, was your passport the new or old style and was it stamped at the rabies section? If you read Brittanies new style passport instructions it does say only required for old style passports that the stamp and signature was necessary. New style passports say the vet must sign and also state name address tel no etc . Stamp not asked for on that page. Has anyone gone through with the new passport signed and not stamped? Sorry didn’t even know there was a new passport. Mine (well Lucy’s) is the old style. Had a look at the Defra site and it states that signature etc required alongside their SP number but that stamp no longer needed. Sorry for duff info. If you are worried about Bilbao also not knowing about new rules try printing out the form on the Defra site and take it along. The people at Bilbao couldn’t have been more helpful, looked at Lucy’s passport and handed over the scanny thing for me to wave over the chip and through we went. Nice big area to walk round as well, bit like Portsmouth but with a better cafe. Ask for bacon egg and chips, there’s no menu but it’s available. We are taking our dog travelling across Europe with us, for at least 2 years. Does anyone know of any pet insurance companies that do long term pet insurance cover for europe? I have seen in several places that some do, but I haven’t been able to find them! Hi, I’m probably worrying uneccesarily here but I’m collecting a dog from Holland and will be bringing him back to England on the tunnel. I’m ok with the whole Calais thing but is there anything I need to do (I’m thinking border wise) between Holland and Belgium and then Belgium to France? I’ve been told that I just carry on driving and have nothing to worry about but worrying I am! Hi. Countries within Schengen are borderless. In these days of heightened security, we’ve come across some ‘spot check’ manned borders but they’ve been few and far between and we’ve just been waved through. We’ve been in and out of five different countries on this trip with no issues. So don’t worry. Have a great trip. Absolutely agree with the last response. I have been stopped a few times for spot checks at borders but this has almost exclusively been the Swiss border, and then only to check on the payment of the vehicle tax. There has never been any problem in Belgium or France and never a problem anywhere in Europe with transporting my 2 dogs. Hi, thanks for your reply. We got home tonight and the only trouble we had was the heat! Super speedy response was very gratefully received so many thanks, Lisa. I am going to retire to Spain at the end of November. I have had my four dogs pas sported, they are already micro chipped from puppies. I intend to go Tunnel with them as I think this is less stressful. Travel through France and then on into Spain. I know they have to be injected again once there, Just worried to death about border crossings. All in good health two elderly 11 and 12 and the other two comparative youngsters at 3 and 5 any information on do’s and don’ts . Hi. Countries within Schengen are borderless. In these days of heightened security, we’ve come across some ‘spot check’ manned borders but they’ve been few and far between and we’ve just been waved through. We’ve been in and out of five different countries on this trip with no issues. So don’t worry. Hi Pam, lucky you. That time of year the weather will be cooler so easier travelling for the dogs. If you’re travelling by car and using hotels then France is very dog friendly. Not sure how far down you are going in Spain but that is a lot better than it used to be, we always manage to find a hotel that will accept our two, a lurcher and a podenco. You just drive off the tunnel at Calais and straight through the French/Spanish border. In Spain it is a legal requirement to have your dogs boosted for rabies annually. Make sure your dogs are protected from all the med diseases and watch out for the processionary caterpillars in the Spring. Different provinces have different regs and you may be required to register your dogs. And enjoy! This is a trip we do regularly with our 8 year old dog. For the first time this year we drove through France to Spain. I must say I find the Pirtsmouth/Santander ferry crossing less stressful and less tiring! We drive down to the South West near Portugal, but I guess if you’re just dipping your toe inside Spain it’s not such a bad journey. On the ferry you can get Pet friendly cabins and then wherever you are going it’s not so far to drive and therefore less time our furry friends have to spend in the car. If you are going to spend a long time there then consider buying decent window shades for the car… (Some companies innUK do custom made window shades for all makes.. Well worth the effort). Recharge your AC and change the filter if you haven’t done it in a while… Your pooches will thank you when the weather gets warmer. Get advice regarding the local diseases when you register with a vet. Some brands of deworming tablets and medications for ticks may be more effective than others one might use in UK. Don’t worry at all about the border crossings… Once out of Blighty it is plain sailing. Don’t forget to change your dogs’ microchip details when you arrive and register. We was in Madeira, Portugal for our holidays. We was there for 3 weeks, towards end of our 1st week someone dumped a 8 week old pup on our road. Woke up to her barking at 7am. She’s stayed with us for 2 weeks till our departure. We decided to keep her and take her back to UK. Shes had her first set of vaccine, but we have to wait till she’s 3 months to recieve the rabies vaccine, then 21 days after that before final set of med for flight such as tapeworm. Only two airlines fly dogs to uk from madiera and both are around £700. Have just found out that a flight Madiera to france is around €100. With this information would it be possible to fly her from Madiera to France, I drive to France and pick her up from airport then tunnel back to uk? All this would be done in less than a day. Would she need tapeworm treatment? Or will her tapeworm treatment be sufficient enough from Madeira? You have a window of between 1 and 5 days following worming to bring the dog into the UK, so yes, as long as the dates are OK that will work. Make sure the wormer contains prazantiquel, droncit, drontal and profender are common ones used. Well done for helping, that’s one lucky pup! Thanks for reply. Looks like a drive to france it is. Dont even know her breed. She’ll be 4 months next time we see her. Great site, it has really put my mind at ease as I am just planning my first trip abroad with our dog. Do you have any suggestions for dog friendly sites/destinations in the Bergerac/La Rochelle/Dordogne areas? We have to travel in August but don’t have children so don’t need kids clubs etc. My main consideration is making sure our dog is happy e.g. access to a stream/lake to cool off, some shade on the pitch, good walks nearby and dog friendly town/village. Any suggestions would be much appreciated. If you can get hold of the ASCII camping sites book you will see loads of info about campsites in the areas you are visiting. You won’t be able to use the ascii card for the reduced prices as it is only active in the ‘off peak’ dates but it will give you all the details you require. I’m assuming you are camping but if you are hoteling it then you will find most hotels etc are dog friendly. France is a very dog friendly place, apart from the beaches during the holiday period. I think you can get an online version of the ASCII sites as well if you are an IT literate person (unlike me who can never get a signal when I need it). A nice site within reach of La Rochelle is at Surgeres, it has a lovely walk behind the site through a park to the town. The vet in the town is good too. Right opposite a coffee shop just up the road from a cave (wine place) and within distance for making it back to the ferry post worming pill! We are planning a short trip to France with our precious Lab. First time to see how it goes! We want to visit some battlefields & wonder how it works if you travel with a dog from France to Belgium too? Any requirements etc? Thank you! Once you are over the channel then Europe is your oyster. The pet passport clears the dog the same as your own. In fact you may not even realise you have crossed the border in most countries. When we did five countries in a day the only thing that reminded us was our phones which welcomed us into Germany, Holland, Belgium, etc via text messages. If your lab is anything like our weimerarner keep him/her away from the doors of patisseries, as I had to replace three baguettes that were hanging out of shopping bags and were licked/bitten/chomped on while the owners fussed her. All very dog friendly although small dog owners (that is owners of small dogs) will cross the road to avoid bigger dogs. Fantastic!Thanks so much for your help!Great site! Hi I am travelling to Grimesnil in La Manche, Normandy in October. Can anyone recommend a vet to get the tapeworm treatment required for the-entry to UK please? Any ideas on cost? Vets in France are very easy to find. They are in most towns, usually on the high street, just ask at the hotel or campsite, ours have even made the appointment for us. Most vets receptionists will ask you to make an appointment 24 hours in advance or they may treat it as an emergency visit and charge accordingly. The cost should be between 25 and 35 euros. Must admit it was one of our worries first time away but wondered why afterwards. I am so confused. Going to Portugal November for five months with my two dogs, a chihuahua weighing 3 1/2 kg and another weighing 6 kg. Have been reading that scalibor is not so good on small dogs, and as you can see one of mine is more tiny than small. What could I use instead ? get some region specific advice from your vet. You may also need to protect your dogs from other specific diseases. The link below lists the tick species in Portugal; your vet may be able to offer advice regarding the effectiveness of the Scalibor collar. Can only suggest visiting a vet and let them give advice. Our dog weighs 25 kilos and we use a medium collar on her. (They come in large medium and small for different dog sizes). She is a smooth coated Weimerarner and has never had a problem with the collar. I always take it out of the packet 24 hours before putting it on so that it has had a chance to dissipate a bit. You seem to be right to be concerned though as some dogs do seem to have a reaction to them. Hope that the vet can help. Be aware of processionary caterpillars as well. They seem to make an appearance end of Feb time, especially around pine forests. Look them up online for more info. I did speak to one of the vets and it is only since looking at various forums that has scared me a little. I think I will put their collars on two weeks before we go, after having them open for a week, then if there is a problem I’ve got time to do something about it. I know about the caterpillars, seen the nests but never the caterpillars. We avoid anywhere we see nests ! Thanks for your advice. We have been using Scalibor collars on our two Parson Russell Terriers (7 kg each) for the past three years on our frequent visits to the Charente and can say that we haven’t had a reaction from either of the girls and have put the collars on straight from the packets, leaving them on for the Summer season. Relieved to report have never found a tick on them, despite their spending a fair amount of time digging and rummaging through long grass. Happy travels! I’m driving to Italy from UK with a Van with my chihuahua Turbo, 18 months old. I will be getting the boat to France,later driving through France, Switzerland and finally Italy. Can anybody confirm whether in all those places dog passport with microchip + rabies vaccination + normal booster would be the required documentation ? Do we need to stop and get off from the van for spot checks at each border ? The documentation requirement is a Europe wide requirement for pet travel in Europe. The only real checks you will encounter will be at the UK border leaving UK and on re-entry. I do this same trip 2-3 times a year and have never been subjected to spot checks related to animals. You will be stopped at the Swiss border to pay the road tax but they are not concerned about dogs. You will need to deworm the dog prior to return to the UK (1-5 days before return). Otherwise it is plain sailing. Have a great trip. Thanks Paul, appreciated. Anyway I will make sure our pet passport is good to go for the UK border. It’s very reassuring ! It’s great to have this blog, I will update you with my experience when I will reach Italy ! We moved from England to here in Italy last year with 3 dogs and 2 cats. We had all full documentation for all the animals. We were not asked to show these once in all the journey! Of course it may be different if we were to ever go back! sorry again, another question: can anyone confirm that with the last PET Travel scheme is fine to have microchip and rabies done in the same day ? It depends on the local procedure. If your bet is able to place the microchip, issue a passport and give the rabies jab then yes. In UK many vets can issue passports but do check. However, in Italy for example the vet must place the microchip after you have paid ASL (the regulating agency) and this and the issuance of a health certificate to travel must be done before the rabies jab is given. Thanks for bringing your point. I went to my local vet that is preparing the passport for my dog and we did both microchip and rabies on the same… I’m just worried to get troubles when I’m going to be at the border control with a dog passport having both microchip and rabies with the same date. Many UK vets are doing both things at the same day so I was just unsure.. do I need to call defra and ask? Don’t worry it’s not a problem. What matters is that you have the dog microchipped, the required paperwork and the rabies jabs. Hello..does anyone know anything about taking dogs as a foot passenger on the Santander-uk ferry crossing? I’ve seen it doesn’t seem possible but not sure why if a pet friendly cabin could be booked as well as the foot passenger ticket. Failing that… Does anyone know of a “buddy up” type system? Splitting costs and sharing car space, just to be able to board the ferry with a dog in tow? I’m moving back to England with my dog and losing hope in finding a way which doesn’t involve driving my own car out and back again!! Please see this link. This appears to confirm your suspicions. Foot passengers may not take dogs (except assistance dogs). Hi, new to the site but can’t seem to find definitive answer to my question. We have taken our Bracco Italiano to France for a few days earlier this year since getting his passport. We had him wormed before we left etc as it was a short trip, no problems all went well. My query is with regards to day trips. I remember our vet saying that these are exempt from worming requirements but can’t seem to confirm or deny this anywhere. Help really appreciated, thanks Alan and Pallino. Really helpful for me when seeking nuanced advice. Hi, great site thank you. I wondered what the general opinion is regards the rabies jab; having seen another scary article like this one it is a bit of a worry thinking about it for the first time for my two year old Wheaten. probably best to talk it over with your vet. There are many scare stories about vaccines in humans and dogs. Like any drug there is a statistical chance that there will be a bad reaction but they are generally very small odds indeed. This doesn’t stop newspapers and websites from generating interest through scare stories. I have been vaccinating my two dogs for several years now and never had any problems and wouldn’t hesitate doing so again in the future. Next May 2017 we are driving through France (from Eurotunnel) to spend one month in El Albir, Spain. We haven’t decided on our route, as yet, as I am having difficulty finding overnight accommodation that will accept our small Parsons Jack Russell dog, have a restaurant on site or within walking distance so we can all enjoy our evening meal (complete with dog if possible). We plan 2 stop overs in France and 1 in Spain before reaching our destination. Any advice on the best route ( we are hoping to avoid Paris) and any dog friendly accommodation would be much appreciated. We have also planned a 5 month winter stay in Spain complete with dog and I have been lucky to get a dog cabin on the Portsmouth/Bilbao route so not as much driving. However I could only purchase the outbound trip and have to wait until July next year to purchase the return. Do the dog cabins get sold quickly? We will be returning to the U.K early April 2018. Most places in France are dog friendly regarding stopovers, we used a place just south of Tours when travelling Northwards earlier this year. Can definitely recommend the Hotel Alisa in Lerma, Spain. Dead easy to find just off the A1 north of Madrid, they have a nice restaurant (dog has to stay in room for that bit) and a nice bar terrace for drinks and snacks. Dog cabins are sold out really quickly, we are in Aguilas southern Spain at the moment, returning late March but are having to go back via Le Havre as there are no pet cabins available near our dates and I’ve been trying since October. As for your route from the Chunnel, we go via A28 Rennes, Le Mans, Tours, Bordaux, San Sebastián, Burgos, Madrid and on down. But you can also take the Eastern route, Reims, Dijon, Lyon, Montpellier, Beziers, Barcelona etc. personally I like the western route as we are in a motorhome and there are more places to stop especially in Spain. You have already made one of the most important decisions – avoid Paris at all costs – Oh, and one other, coming to Spain for the winter, you’ll love it. Hotel Alisa is about 3 hours from Santander/Bilbao and about 4 hours from your destination. I haven’t done this trip personally so cant advise you regarding accommodation en route. However a couple of general pointers. If you use one of those websites to find accommodation (I use booking.com) you can apply filters so that only pet friendly accommodation is listed among other filters to tailor your stay to your needs. There are many many pet friendly accommodations in France so it really shouldn’t be too hard to find somewhere suitable. If you are staying a while check with a vet when you arrive, there may be local diseases your dog should be getting preventative treatment for. Any vet can give the deworming treatment, just make sure it is stamped and signed with the date and time on the correct page (I got refused at the UK border for that little oversight just recently) and of course 1-5 days before entry to the UK. Thank you kindly for your reply and advice, very much appreciated. Hi, I am travelling to Spain from England at the end of the month with my lovely whippet. I was planning on hitch hiking most of the way but I was going to take the ferry from Portsmouth to santander and pay for my dog and I. However, it transpires that they do not accomodate dogs with on foot passengers… so I am a bit stuck. Do you have any advice? Great blog, thanks very much for all information shared. I’m going to travel with my dog beginning of May from UK towards France, Germany, EU countries. I’ve got EU passport, the new version, where yesterday my vet did the rabies vaccine but didn’t stamp it, he said that on the new passports is not required anymore. But also he didn’t put his name on the box, only address, telephone, SD number and signature. Shall I go back to ask him to put the name too. Also he didn’t count well the 21 days, and instead of valid date 06/04/2017, he put 05/04/2017, one day less. Do you think the custom officer won’t let us leave the uk because of this? Maybe is good to mention that we will travel by car with the ferry. Absolutely you must check. My experience is that DEFRA are very precise in their requirements. This includes even how the time and date are formatted. I am almost certain that a stamp IS required. If there is anything irregular about the passport and it does not conform to DEFRA regulations you will be refused passage by the carrier. I speak through experience of being refused a ferry boarding in France about 6 months ago. All of the requirements were in place but there were concerns about the placement of the stamp on the page! In fact Defra responded thet they are not checking the passport and is my vet responsibility. At the end of April I am taking my dog to Spain via Euroshuttle. We have three overnight stops at dog friendly hotels booked to reduce the amount of time the dog has to spend in the car. My dog has recently had the vet checks, rabies vaccination and new pet passport. I am really looking forward to this first time experience however I am really struggling to find pet travel insurance to cover a period of more than 31 days. Please can anyone give me any advice on this matter? Can you please help me with a picture from your dog’s passport, the page with the rabie vaccine? I’m trying to identify if my vet completed the page in a correct fashion, because he didnt put any stamp on it. I use LV pet insurance which is valid all over Europe all year round. DEFRA don’t check the passports but they do regulate the carriers. You need to check with your carrier what regulations they are following. You may find that the carrier will require the stamp and you may be denied passage. Don’t leave it to chance! In U.K. not all vets are designated as having the authority to stamp the rabies vaccination in the passport. I would strongly advise you to do a search online, there is a website that lists designated vets according to postcode. I had my dogs vaccinated only a couple of months ago and they did get a stamp in the passport which was at that time part of the regulations. The stamping of the vaccination is a requirement in France and Italy (and apart from your conversation with DEFRA) was the same in U.K. until a few weeks ago. Some vets charge up to £50 just to stamp the passport if another vet has given the vaccination. I went to Vets4Pets and it cost £22 including the check up for the dogs. I am still not convinced that my vet did the right thing in regards to the passport completion. It charged me £55 to do the vaacine. We have booked a dog friendly cabin on the Cap Finistère but I have now read that our dog must stay alone in the car for at least an hour after we board and again at least another hour when we are due to dock in Spain- is this true. He is a highly sensitive dog having had a bad experience as a puppy and hates being away from us hence dog cabin not kennel. Please advise as I am getting worried about it. There will be no way around regulations although these may vary according to the carrier. However there are some things you can do. You can see your vet and have him prescribe a sedative. There are some medications which may be particularly useful for separation anxiety. In addition you can get the help of a dog behaviourist (or a recommended experienced and knowledgeable positive trainer) who can help you go through some procedures to help you train your dog to be less anxious during periods away from you. Hi there, yes you will have to leave your dog in the car for approx 30/60 minutes. Could you not try leaving your dog a few minutes at a time in the car now to get them used it being a safe place? The approach to leaving the dog in the car for a few minutes at a time and gradually increasing it to 30-60 minutes might be the right approach and it might be that simple. However (as a dog behaviourist myself) I would suggest that you get advice from a vet or appropriately experienced trainer since it could be a more complex issue and simple desensitisation may not be entirely effective. Please let me tell you that I’ve traveled without any checking from uk through France, Austria, Germany, Hungary and Romania. No one checked my dog’s passport not even on the Eurotunel. Probably on the way back they will be more restrictive. Same thing happened to me leaving U.K. last month. That said I wouldn’t take a chance that they won’t check on the way back in, do be sure to get your deworming done. The security guy on the uk custom told me when I wanted to show him the passport, no need it now, when you’ll come back will be required. So, yeah I will have everything in order on my return. When I took the ferry from England to the Netherlands, no-one checked our dogs passport at all. Since then we’ve travelled through Belgium, Luxembourg and France without any further checks. However, when we took the ferry from France to England, they checked it very closely. I think that’s the direction you need to be more concerned about. We are touring fran with in our motor home in a couple of weeks and both dogs have their passports. Is there any need for us to take their vaccination records as well? It’s probably a good question for your vet. The vet should be able to tell which diseases are endemic to any particular area and advise if the medication you are using is appropriate. Sorry spell check let me down – I meant to say France! Do you know if anyone can pick up the dog from Calais if left there overnight because of a treatment that didn’t allow it to travel? The driver who was supposed to bring it to me from Romania to Uk had to leave the dog at the border overnight as he couldn’t wait because of personal obligations. I need to pick my dog from there tomorrow after 10 o’clock so I am wondering, can just anyone pick it for me? I have work so I am unable to go. My boyfriend can go but he is not in the dog’s papers, and the driver told me he received a paper to use tomorrow when he picks my dog, does that mean that he is the only one who can take the dog? Hi, I have just realised that the rabies vaccine has expired on my dog passport about a month ago. Can you let me know if we need to start from the beginning I.e. new passport or is it possible just to do a new entry on the same passport with a new vaccine rather than a booster but wait 21 days before we travel back to the UK? We are due to leave the UK in two weeks. Thanks a lot. Just get another vaccination and wait the 21 days. Just recently the passports haven’t been getting checked on the way out of UK but I wouldn’t recommend risk leaving in 2 weeks hoping they won’t check. Pretty sure that you will need to start the series of jabs again if the booster wasn’t given within the right timescale. The same passport can be used with a new entry. You will have to ask your vet or contact DEFRA about travelling though as the rules are quite prescriptive. Still deciding where to take our first dog travel this year – have passport/done jabs, unfortunately we are confined to August. Thinking of the italian lakes – to be near the water, or Tuscany/beaches. The further south we go however, I’m a little concerned about the temperature. Has anyone been that far south, and any thoughts/experiences of Italian lakes? What restrictions are there travelling to Calais with a dog (passport all in order) for only one day, but overnight? Do I still have to approach a vet in Calais and can anyone please recommend one? Your only restrictions are to ensure your dog is seen by a French vet no less than 24 hours from the point at which you want to return – including minutes and all. So you might want to do it as soon as you arrive, it’s a minimum of 24 hours but a maximum of five days so there’s no problem if you depart later but you can’t depart any less than 24 hours from the point of that stamp and worm tablet. We ended up staying an extra week at our own choice after we’d seen the vet so we had it done again the following week and had absolutely no problems finding a vet anywhere in Europe. You can email and call ahead before you leave the UK to make an appointment hope that helps. I will be bringing my friends 2 dogs over to the uk for a couple of weeks from Belgium while she is on holiday. My question is who’ll it be an issue that their pet passport is Belgium and mine is a uk passport? Do I need anything else to travel with them? No problem having a different passport for you and your dogs. Just make sure they have had the rabies vaccine at leat 22 days before you travel and that they have been dewormed. The deworming needs to be done for the UK at least one day before you arrive in UK and no more than 5 days before. When you go for the deworming just check that the microchip works as they will test it before you are allowed on the ferry. Thanks for this site, it has been really helpful. We are due to come back from Santander to Portsmouth on Daturday after three months travelling. We’ve emailed two vets in Santander to make an appointment for our lurcher on Thursday/Friday without response. We don’t speak a Spanish. We are currently in Portugal and heading across into Spain tomorrow. Can anybody recommend a vet between Santiago de Compostela and Santander? Should we go to arrange an appointment the following day? 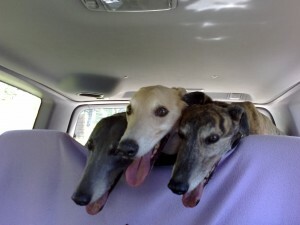 Hiya, we’ve used vets in France and Spain for our hounds over the years, they’re most of them used to doing passports. Use a free translation site on your phone or write the translation down and go in and ask. “Tiene una cita para pasaporte del perro por Reino Unido” Ask them to write the day and date down. You could also ask in a tourist info office if they will call for you and make an appointment, some are helpful and will. I have a question. I am taking my italian greyhound to Europe (we are from Canada) and his rabies vaccine will expire once we are there. Will this be a problem? No, just visit a vet wherever you are and they will do it and stamp your passport. Don’t forget, it is a legal requirement to have up to date rabies protection in most EU countries, check online for the countries you’re visiting as to their specific requirements. Don’t forget to protect your dog against ticks and sandflies too. Have fun! Hi there, we are taking our dog to Spain this year, taking the euro tunnel and driving through France. We understand the passport requirements and tapeworm treatment including prior to returning. When we travel from France to Spain though is the passport checked there and are there any extra requirements by the authorities? Thanks. I am trying to fly my dog into the UK. I am finding it very expensive and keep getting the answer of you must fly your dog by cargo, we recently flew from Colombia to Kazakhstan, the cost for the dog was $400! We are now being told it will cost around €900 to fly from Amsterdam to Manchester. Who have you flown with? What was the cost? Any advice would be appreciated! Thanks. What about those Processionary Caterpillars? France in August – just how busy was it? Post script – things don’t always go to plan!